Have you seen the latest news about tire blooming? It’s becoming a problem for many tire manufacturers. This is when cars collect grime and dust in the grooves and tracks of their tires, leading to brown spots and damage. If you notice your tires are turning brown, then you need to wash them with a superior cleaner and use a tire brush to get all of the grime out. You should always start your car wash with your tires as well. 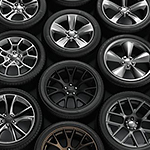 Since your tires are made of rubber, you want to pick a professional grade cleanser that can clean your tires without causing any issues with the coating, even if it’s anodized. When cleaning your tires, make sure to rinse off all of the cleaner before you go on to the rest of your vehicle as well. After your car wash, make sure to wipe down and dry all tires with a microfiber towel. Want to ensure that you get the best clean? Stop by the service department at Yucca Valley Chrysler Center.